This cool set reminds me of playing in a cool summer pool! 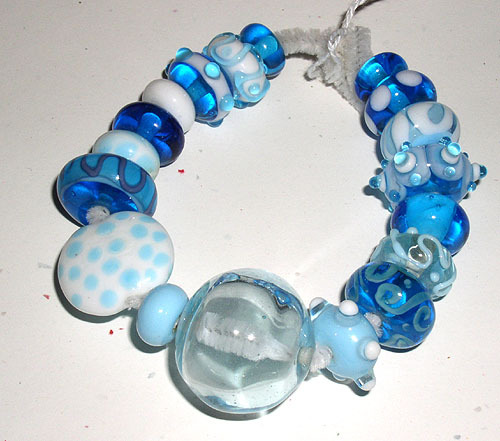 LARGE Hollow aqua bubble center focal, with lots of cool aqua and white beads! First Sale based on Date/Time of message, payment due five days after confirmation.. I accept PAYPAL, Check or money Order. Good deals - great beads! Just need new homes.....EMAIL QUICKLY to make sure you reserve the item! Otherwise item will be offered to the first individual who offers payment! Sales Tax for Ohio residents. EMAIL ME FIRST with your county! 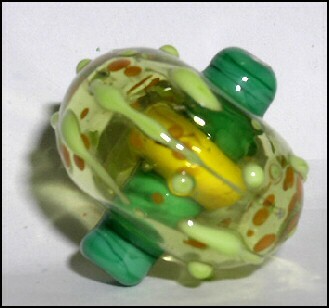 This tube-through-bubble would make a striking focal bead. Happy green colors! 30 mm diamter. 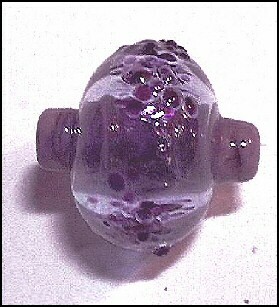 Central tube is a more muted purple (lavendar) than photo shows. 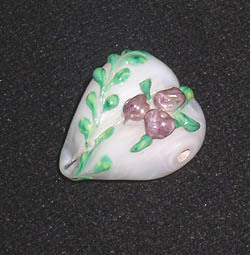 bad photo but pretty heart, flowers are not great but the heart is beauiful. 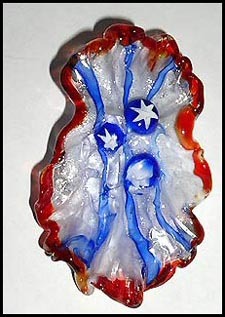 Bottom looks distorted but IS NOT - the satin glass is slightly translucent and let dark behind it through.... Slight flaw on the other side (rough glass) but not visible from front. 19mm x 11 mm - New Year's Bead! Order now - limited supply! 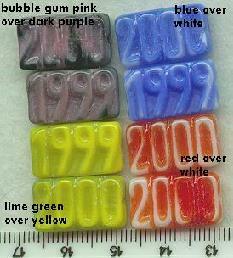 THESE WERE LIMITED EDITION and will be COLLECTIBLES SOMEDAY!!!. loop on back for hanging on cord or chain.